The story: This month, Al Young marks 50 years of service at Four Roses. In 1990, he became distillery manager and in 2007 he was named brand ambassador, a role that has him crossing the country sharing the Four Roses story. He’s also the official historian for the brand, having told its story in the coffee-table book “Four Roses: The Return of a Whiskey Legend,” published in 2010. 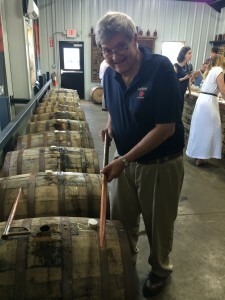 He was inducted into the Whisky Magazine Hall of Fame in 2015 and is also a member of the Kentucky Distillers’ Association Kentucky Bourbon Hall of Fame. To commemorate this golden anniversary, Four Roses is releasing this limited edition Small Batch Bourbon, blended from four of Four Roses’ 10 unique recipes that were selected by Al and Master Distiller Brent Elliott. The 50th Anniversary Small Batch is 5 percent of a 23-year-old selection of Four Roses’ OBSV recipe (delicate fruitiness), 25 percent 15-year-old OBSK (full-bodied, light spice, caramel), 50 percent 13-year-old OESV (light, creamy, fruity) and 20 percent 12-year-old OBSF (herbal, full-bodied). 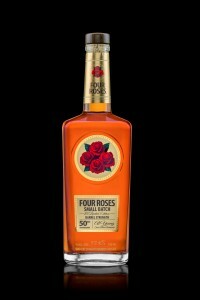 For this bottling, Four Roses selected a retro bottle shape and label, modeled after the bottle design from 1967, the year Al Young started with the company. The 2017 Limited Edition 50th Anniversary Small Batch Bourbon will officially launch on Saturday (June 10) at Whisky LIVE Louisville, but the folks at Four Roses were kind enough to send me a sample for this review. The aroma: Floral and very fruit-forward (red apple) with the sweetness of caramel. Very little alcohol presence, especially for this proof level. The taste: A noticeable zing on the front, like the spritz from squeezing an orange peel; nice full sweetness mid-palate with more of that creamy caramel and bright fruit; pecan note follows on the back. The finish is dry spice, like nutmeg, but very long and warming with absolutely no burn. A drop of water opens up more of that orange zest and adds a note of apricot. The verdict: Just like Al Young himself, this Limited Edition Small Batch is a warm and welcoming ambassador for Four Roses. It’s full-bodied and complex, revealing new layers with every sip. Approximately 10,000 bottles will be distributed beginning this month; if you have $150 to spend on bourbon, this one is worth it. Great review! Can’t wait to try and get a bottle of this. Four Roses has easily become one of my favorite bourbons (OBSK recipe especially) and I can’t wait to try and get this to see what some of their recipes are like with some older ages on them. have been searching everywhere for a bottle of this for my husband. He loves his bourbon and this would a great addition to his collection. Anyone know where I might find a bottle?